WOLVERHAMPTON squeezed through to the Premiership Grand Final by a single point - but now face an anxious wait over the fitness of inspirational skipper Freddie Lindgren. The Grand Prix superstar crashed out of their 51-39 second leg defeat at Belle Vue, a result which saw them edge their semi-final clash 90-89 overall. Lindgren had been instrumental once more for the Parrys International Wolves, romping to four straight race victories. But the Swede tangled with home No.1 Kenneth Bjerre in Heat 13 and landed heavily on his neck after a spectacular spill. He was soon withdrawn from the meeting and was eventually taken to hospital. The incident left an overriding sombre feeling on what should have been a night of celebration and joy for the reigning Champions as they successfully qualified for the Grand Final for a second successive season. 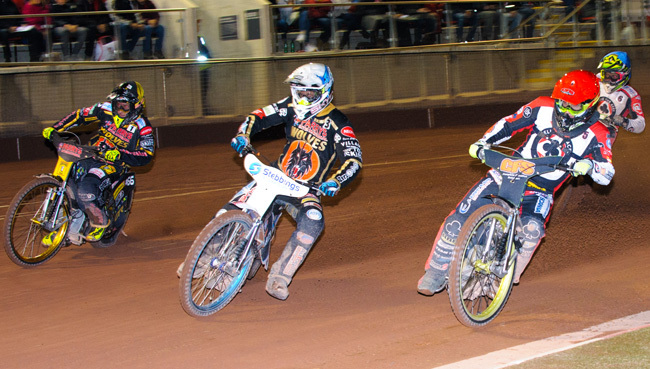 Winning five of the opening seven races certainly helped settle any existing nerves for the visitors, but the hosts edged their way back into contention bit-by-bit and a 5-1 in Heat 12 saw the gap reduced to just five points on aggregate. Then came the Heat 13 incident involving Lindgren which saw Bjerre excluded for Belle Vue in a brave decision by SCB Referee Phil Griffin, much to the evident dismay and disgust of the home crowd. But a 3-3 in the re-run, with Nathan Greaves taking a reserve ride for Lindgren, meant Belle Vue required a heat advantage in the penultimate race to take it right down to the wire. But Rory Schlein had other ideas and made a breathtaking start from gate one to hit the front and wrap things up for the Wolves with a race to spare. "It's a tough one right now because we're buzzing and we should be celebrating,Schlein said. "But naturally some of our main thoughts are with Freddie at the minute and fingers crossed he's going to be okay. "In both legs we've been up against it in the end. "We lost Jacob (Thorssell) in Heat 14 on Monday then we lost Freddie, who was on fire, in Heat 13 here and we've really had to dig deep and battle hard. "But regardless of what's gone on, we have to stay positive. "Both Jacob and Freddie would be telling us what we need to focus on and that is now the Grand Final. "While it's not exactly in ideal circumstances, we've achieved two of our three goals now. "We qualified for the play-offs and we've now qualified for the Final. "Now all we have to do is go and win the thing again and trust me we're a determined bunch!" The Parrys International Wolves will travel to Swindon for the first leg on Monday (7.30), before hosting the decider at Monmore Green 48 hours later on Wednesday, October 4 (7.30). Full details regarding Wednesday's home leg, plus an update on Freddie Lindgren will be released in due course. BELLE VUE 51: Craig Cook 15, Kenneth Bjerre 10+1, Dan Bewley 8+3, Rohan Tungate 8+1, Steve Worrall 7+2, Jack Smith 3+1, Max Fricke R/R. WOLVERHAMPTON 39: Freddie Lindgren 12, Sam Masters 10, Rory Schlein 9, Mark Riss 4, Kyle Howarth 3, Nathan Greaves 1+1, Jacob Thorssell R/R.